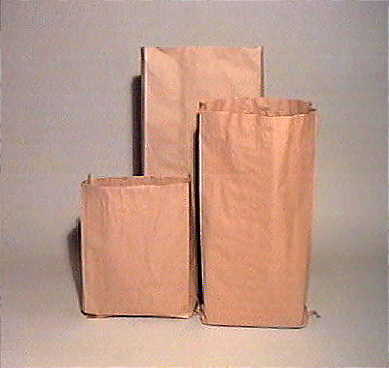 Brown Paper multi-wall (2 or 3 ply) sacks for general packaging as well as for farm produce. Dimensions are: width with side gussets closed, then side gusset width, then height. The paper sacks on this page that show a weight capacity are designed as strong farm produce sacks, capable of holding up to 25kg of produce. The smallest sack, the 12" x 18" + 5" sack, is not designed for farm produce. We mostly sell these to customers who send out mail order goods in them. The largest sack, the 16" x 9" x 39" sack is also not designed for farm produce. It is generally sold as a paper refuse sack. PLEASE NOTE: Due to the popular demand by smallholders, allotment enthusiasts etc. for paper sacks in small quantities we are now offering all our paper sacks in packs of just 5 sacks! Look down the Pack Qty column below to see the new small quantity packs. Product description: Brown Paper multi-wall (2 or 3 ply) sacks for general packaging as well as for farm produce. 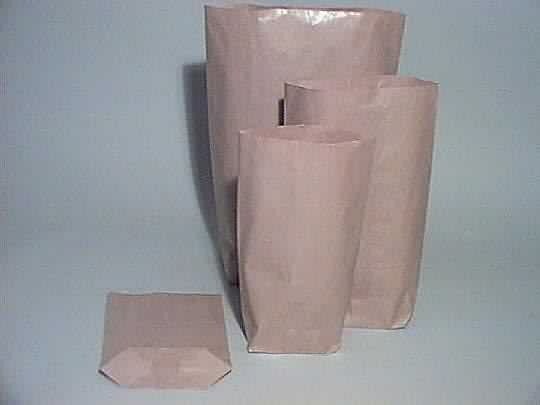 Description: "Photo of paper sacks"
Brown Paper Sacks. We stock a good range of sizes of paper sacks, with many uses, but our most popular sacks are for farm produce (potatoes etc). We also sell all our sacks in small packs of 5 sacks, suitable for allotment holders etc. 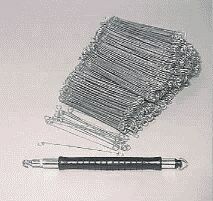 Steel wire ties for tying around the necks of sacks, usually using a tying tool (see below). The wire ties are made of steel and have a loop at each end which you can place over the hook of a tying tool for rapid fastening of the tie around the neck of the sack. Product description: Steel wire ties for tying around the necks of sacks, usually using a tying tool (see below). The wire ties are made of steel and have a loop at each end which you can place over the hook of a tying tool for rapid fastening of the tie around the neck of the sack. Description: "Photo of loop ended sack ties"
Paper Sacks, Sack Ties and Tying Tools. The sack tie tying tool is for use with the wire ties above. It is a heavy duty steel tool with a hook on the end that you pass through the loops on the ends of the wire tie, after the tie has been placed around the top of the paper sack. Then, as you pull the tying tool, it rotates the hook, which in turns twists the tie around the top of the sack, fastening it tightly. Product description: The sack tie tying tool is for use with the wire ties above. It is a heavy duty steel tool with a hook on the end that you pass through the loops on the ends of the wire tie, after the tie has been placed around the top of the paper sack. Then, as you pull the tying tool, it rotates the hook, which in turns twists the tie around the top of the sack, fastening it tightly. Description: "Tying tool for wire sack ties"